Each vertice of the mesh is in a domain of . The values associated to the vertices of the mesh. The size of values is equal to the number of vertices in the associated mesh. So we must have the equality between values.getSize() and mesh.getVerticesNumber(). where the are the vertices of a mesh of the domain and are the associated values. Mathematically speaking, is an element where is the number of vertices of the mesh of the domain . asDeformedMesh(*args) Get the mesh deformed according to the values of the field. draw() Draw the first marginal of the field if the input dimension is less than 2.
drawMarginal([index, interpolate]) Draw one marginal field if the input dimension is less than 2.
exportToVTKFile(fileName) Create the VTK format file of the field. getDescription() Get the description of the field values. getInputDimension() Get the dimension of the domain . getInputMean() Get the input weighted mean of the values of the field. getMesh() Get the mesh on which the field is defined. getOutputDimension() Get the dimension of the values. getSize() Get the number of values inside the field. getTimeGrid() Get the mesh as a time grid if it is 1D and regular. getValueAtIndex(index) Get the value of the field at the vertex of the given index. getValues() Get the values of the field. setDescription(description) Set the description of the vertices and values of the field. setValueAtIndex(index, val) Assign the value of the field to the vertex at the given index. setValues(values) Assign values to a field. Get the mesh deformed according to the values of the field. The positions at which the coordinates of vertices are set to zero when extending the vertices dimension. By default the sequence is empty. The positions at which the components of values are set to zero when extending the values dimension. By default the sequence is empty. The initial mesh is deformed as follows: each vertex of the mesh is translated by the value of the field at this vertex. Only works when the input dimension : is equal to the dimension of the field after extension. Draw the first marginal of the field if the input dimension is less than 2. Draw one marginal field if the input dimension is less than 2. Indicates whether the values at the vertices are linearly interpolated. If the dimension of the mesh is and interpolate=True: it draws the graph of the piecewise linear function based on the selected marginal values of the field and the vertices coordinates (in ). If the dimension of the mesh is and interpolate=False: it draws the cloud of points which coordinates are (vertex, value of the marginal index). If the dimension of the mesh is and interpolate=True: it draws several iso-values curves of the selected marginal, based on a piecewise linear interpolation within the simplices (triangles) of the mesh. You get an empty graph if the vertices are not connected through simplicies. If the dimension of the mesh is and interpolate=False: if the vertices are connected through simplicies, each simplex is drawn with a color defined by the mean of the values of the vertices of the simplex. In the other case, it draws each vertex colored by its value. Create the VTK format file of the field. Name of the output file. No extension is append to the filename. Creates the VTK format file that contains the mesh and the associated values that can be visualised with the open source software Paraview . Get the description of the field values. Description of the vertices and values of the field, size . Get the dimension of the domain . Dimension of the domain : . Get the input weighted mean of the values of the field. Weighted mean of the values of the field, weighted by the volume of each simplex. where is the simplex of index of the mesh, its volume and the values of the field associated to the vertices of , and . Get the mesh on which the field is defined. Mesh over which the domain is discretized. Get the dimension of the values. 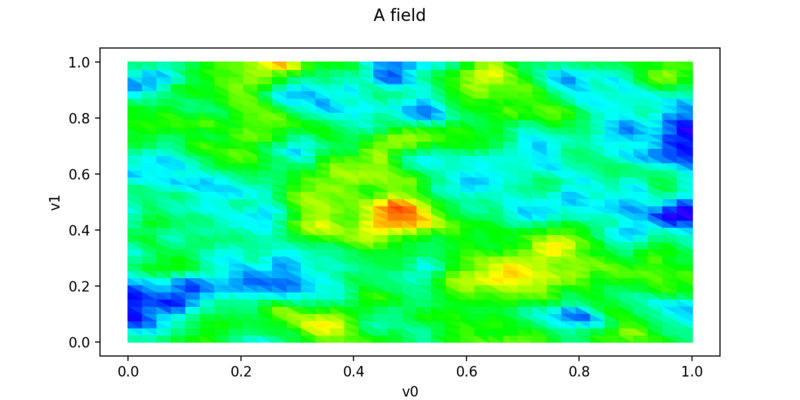 Dimension of the field values: . Get the number of values inside the field. Number of vertices in the mesh. Get the mesh as a time grid if it is 1D and regular. Mesh of the field when it can be interpreted as a RegularGrid. We check if the vertices of the mesh are scalar and are regularly spaced in but we don’t check if the connectivity of the mesh is conform to the one of a regular grid (without any hole and composed of ordered instants). Get the value of the field at the vertex of the given index. Vertex of the mesh of index index. The value of the field associated to the selected vertex, in . Get the values of the field. Values associated to the mesh. The size of the sample is the number of vertices of the mesh and the dimension is the dimension of the values ( ). Identical to getSample(). Set the description of the vertices and values of the field. Description of the field values. Must be of size and give the description of the vertices and the values. Assign the value of the field to the vertex at the given index. Index that characterizes one vertex of the mesh. value : Point in . New value assigned to the selected vertex. Assign values to a field. Values assigned to the mesh. The size of the values is the number of vertices of the mesh and the dimension is .